The term, "date night," used by long term couples (especially the co-habitating kind) kinda bums me out and I try to avoid using it at all costs. Friends, it's ok if you say it (but not if you say it in a sing-song way- and if you are sensitive to this term, you know that this happens far too often). However, you are not going to catch me saying, "Last night was our date night! We went to dinner and drinks!" No, I much prefer, "Last night we went to dinner and drinks." Done. 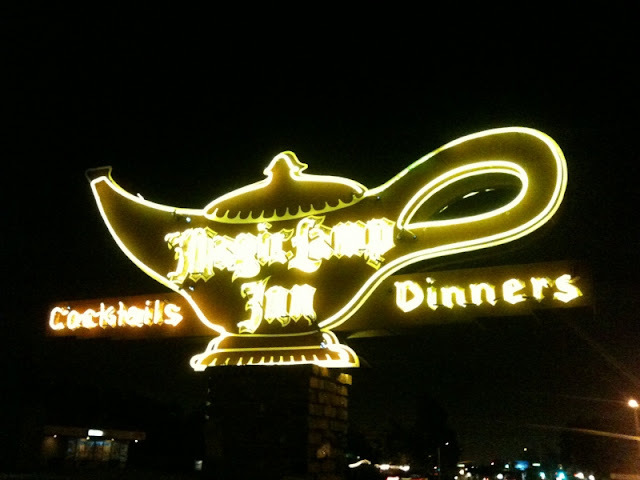 Jeremy's only day off is Sunday so, I suppose, that's totally our DN or more accurately, our DD, but as of last weekend, I called it, "Hey, let's go to Rancho Cucamonga and go thrifting, play skeeball, and get dinner at The Magic Lamp Inn." annnd finally made it to The Magic Lamp Inn. 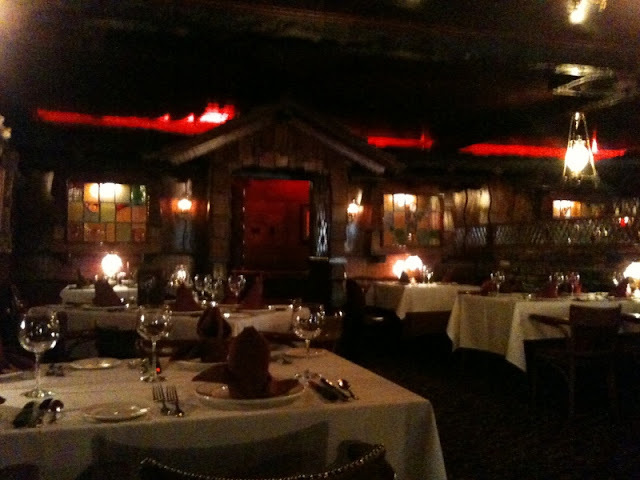 Located on old route 66, the decor is kinda Madonna Inn-y but with reds instead of pinks, the patrons were all over 60 years old, and the roadside sign is a neon magic lamp that SHOOTS OUT FIRE. 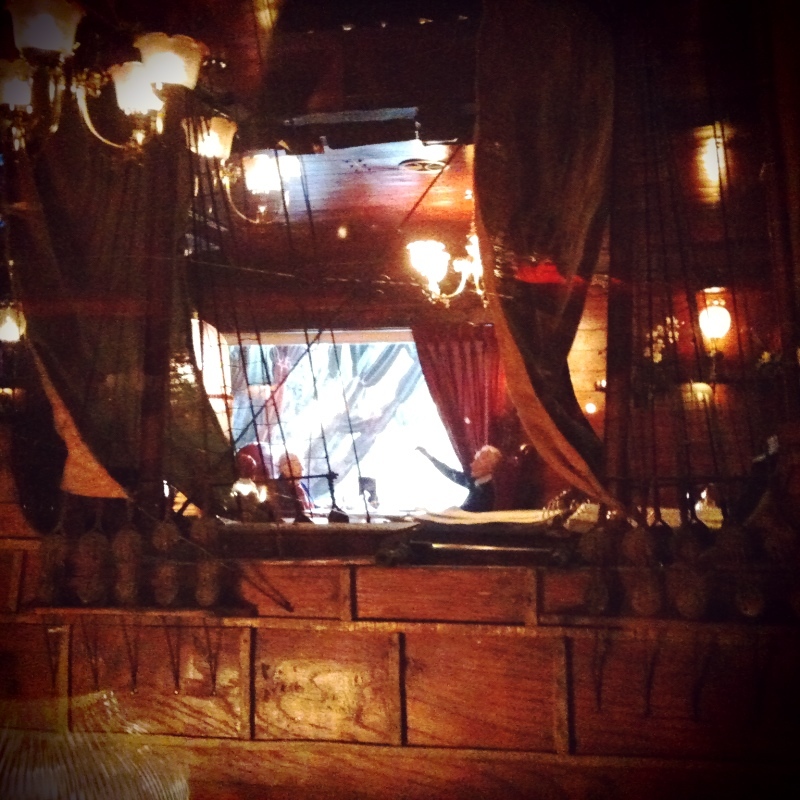 The dining room had a fake village facade and a model ship in the glass windowed wall next to us. I know that sentence doesn't make much sense, but stay with me. There's a giant fire pit in the restaurant that you can lounge around on the red leather upholstered circular seating and in the evenings there's karaoke in the bar. Again; everyone is over 60 so the karaoke choices and the crooning are at full force awesomeness. Jeremy sang some Johnny Cash and I took a video- my favorite part of which is when a guy in a walker slowly scoots in front of the camera. Anyways, it was a highly recommended evening- however you want to classify it.